We had a nice relaxing start to the day. Over breakfast we swapped stories about the events of the evening. Joseph and I are rooming together. Despite the fact that my dog chewed up my snore guard mouth pieces he said my snoring wasn’t too bad. The big story comes from the Crenshaw family. Brianna scared her room mates when she began screaming in her sleep. She got up and ran around the room trying to get away from the imaginary bugs that plagued her dreams. When she woke up this morning she told Carmen and Melinda that she had a funny dream about bugs. They politely said yeah we know and explained what happened. Full contact sleep walking can be quite entertaining. Dream Screamer seems like a fitting nickname to replace Pigtails. The group hung out at the hotel this morning. We toured the ruins, walked through the gardens and enjoyed a variety of beach activities. I especially enjoyed kayaking around the beach front. The Indian Ocean is beautiful. There was a steady stream of fishing boats crisscrossing in front of our beach area. It was a perfect location to enjoy a cool Stoney Tangawizi. Bill swam for a while and ended up with water in his ear. We began a search for some rubbing alcohol and stopped at a duka, but no luck. We then stopped at a roadside pharmacy. Bill said he was looking for alcohol. The pharmacy owner thought Bill was looking for something to drink and refused to sell him anything. After that bit of confusion was cleared up Bill ended up with the purple concoction. I can’t believe he poured it in his ear. It is clearly marked for external use only. 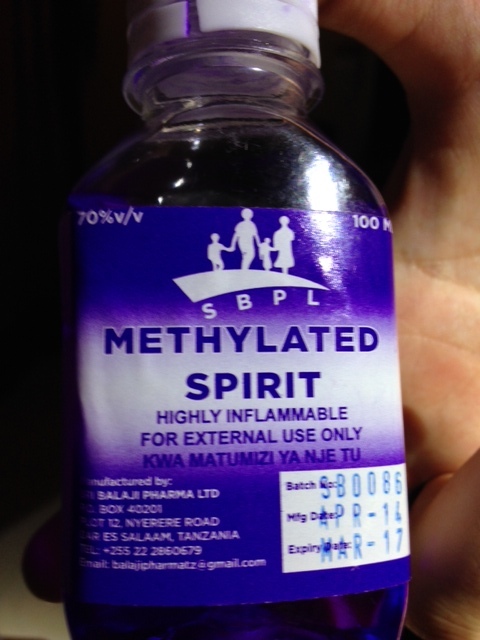 Oh well, if you are going to pour a purple liquid in your ear, make sure it is “highly inflammable.” The good news is that it worked. After lunch we headed in to Stone Town and toured Christ’s Church. This Anglican Church was built on the site of the old slave market. The Portuguese and later the Arabs ran the East African slave trade from Zanzibar from the 1400’s until it was outlawed in 1873. 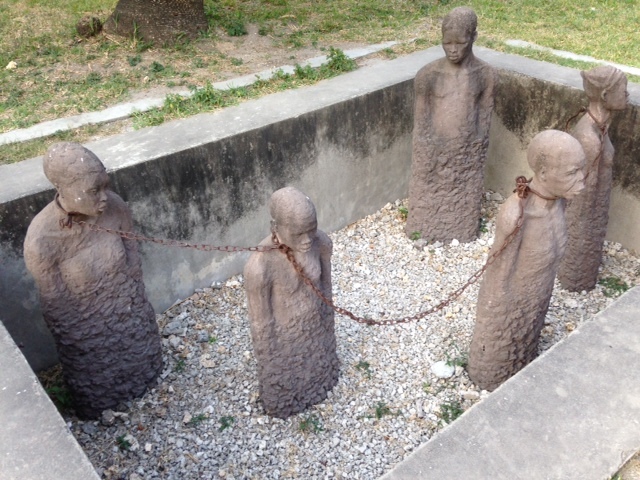 The slave trade continued illegally until 1905. Hundreds of thousands of slaves passed through here on their way to South America, the Middle East, and the Far East. 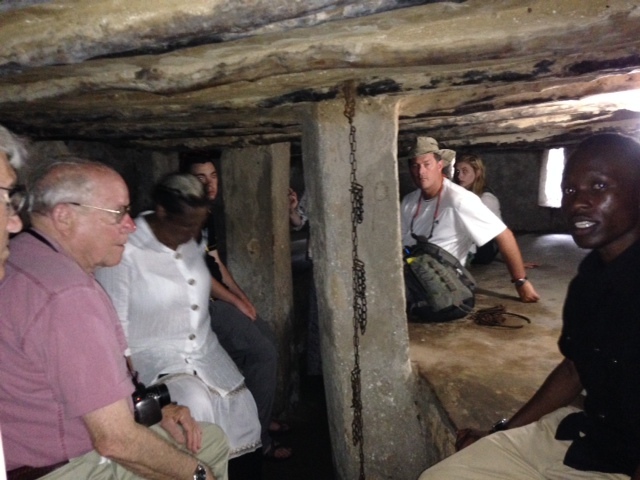 At the church site we also toured the slave quarters. As many as 75 women and children would be crammed into the room. They would wait in that chamber for up to 3 days with no food or water until they were sold. I can’t understand how people could rationalize treating other people like this. This a dark part of our collective history. The good news is that the church played an active part in bringing about an end to slavery. This evening we enjoyed the food of the street vendors again. It is a unique dining experience. In the next room Bill, Carmen, and Melinda, are teaching Joseph to play spades. It is a fitting end to a relaxing day of fellowship. Tomorrow we head back to Dar es Salaam.